What the hell is an ORCA Card you ask? Only a wicked awesome tranist fare Smart Card. 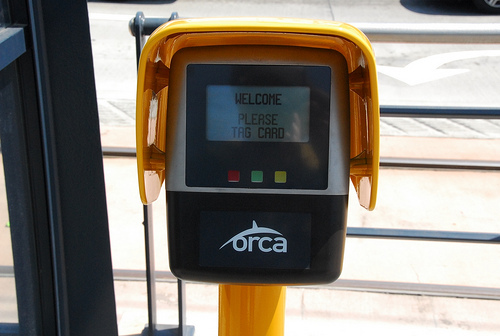 The ORCA (One Regional Card for All) is the Seattle area’s version of Smart Card transit fare technology which is taking root around the world. London has their Oyster card, Hong Kong Octopus, and the Chicago Card are among many other Smart Cards out there. What struck me about ORCA and why it applies to Providence is that the ORCA provides fare services for seven regional transit agencies, and the fare services can be bought in various configurations. For example, say you ride Sound Transit commuter rail into Seattle every weekday, then take a King County Metro bus from the train station to your office. You can have a discount monthly Metro and Sound Transit fare charge applied to your ORCA card. But say you occassionally take Washington State Ferry and occassionally use Community Transit buses? Not every day, so you don’t want a monthly pass for those services. No problem, ORCA can also deduct cash fares from your “e-purse” account built into ORCA. This makes using transit in the Seattle area seemless. 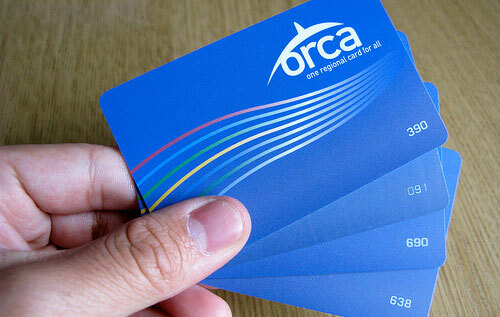 As long as you have your ORCA card in your pocket, you know you can board any transit service. And if you ride a particular service often enough to warrant a monthly fare, ORCA handles that too. How does this apply to Providence? Well, we have RIPTA and MBTA running into Providence (and the MBTA soon to move further south into the state). Also in our metro area we have GATRA and a smattering of other transit agencies in southeastern Massachusetts. Not to mention transit services in Connecticut. Not all of these services directly connect, but riders may mix through these service areas, especially with the Commuter Rail tying all these service areas together. Say someone wanted to take GATRA to the Attelboro T station, the T to Providence, and a RIPTA bus to their job at RI Hospital. That is three transit systems and three fare products (or the need to keep track of having the proper cash for each of three services). The biggest benefit of ORCA, or a like system, to me is, the ability to load the card like a debit card and have it in my pocket when I need it. Though I don’t own a car, I actually ride RIPTA rather infrequently, mostly walking everywhere. I’d likely use the bus more if I had a card in my pocket that I knew would get me on it, not needing to dig for change to jump on a bus I wasn’t necessarily planning on taking. The best RIPTA fare card for me currently would be the 15 Ride card which offers 15 discounted rides, but is still not ideal. I need to remember how many rides I’ve used, say I have one ride left, but need to do a round-trip, now I’m out of luck. ORCA, if I had one ride left, but needed a round trip has an auto re-load option, so when I boarded that return bus but my ORCA was empty, ORCA would debit my account by the amount I told it to auto-debit when my card was empty. Also, to get a new 15 Ride RIPTA pass, I have to go somewhere. Say I use the last of my 15 Rides to get home. Now I’m stuck at home with no fare card and have to pay cash to go somewhere (for me the most convenient place would be Kennedy Plaza) to get a new card. ORCA allows for me to manage my account online (or if one is not online, then by phone). So if I ever got home with an empty ORCA (if I didn’t have auto-debit), then I could login or call and be good to go with more money on my card. As I said, ORCA is a Smart Card. Currently if one wants a transfer on RIPTA, depending on which fare card you are using (or if you are paying cash), you have to ask the driver to give you a transfer when boarding. You also have to pay for that transfer, which you may or may not use (say you get sidetracked and your transfer expires, you are S.O.L.). ORCA figures out the transfer for you. When you board the next bus (or train or ferry) ORCA figures out if you are eligible for a transfer rate and detucts the proper fare for you. No need to remember to get a transfer, no lost transfer tickets, no paying for tranfers you don’t end up using. Smart Card techology can even extend beyond transit use. In Hong Kong the Octopus card is a true City Card used for “payment at convenience stores, supermarkets, fast-food restaurants, on-street parking meters, car parks, and other point-of-sale applications such as service stations and vending machines.” Introducing a City Card such as Ocotpus is a way to get transit directly into the pockets of non-transit riders. Someone who drives into Providence may buy a City Card for parking, but now realizing that they have a transit card as well, may hop on the trolley or a bus to go somewhere else while parked downtown. A first step toward creating a transit convert. Making the card widely usable also expands the areas where they can be purchased and refilled. Imagine RIPTA Smart Card kiosks in every Dunkin Donuts. If you can use the Smart Card to buy coffee, that incents Dunkin Donuts to install vending machines. I porpose we call our Smart Card the Quahog, now we just need to come up with an acronym for why it is called Quahog and we can start handing them out. The ORCA Card sounds like a great thing and this is what I thought the Charlie Card/Ticket was suppose to do for the MBTA and the region. The Charlie Card is rechargeable via there website https://charliecard.mbta.com/ or at a kiosk. It is currently accepted on the just the subway lines, although I thought, when they introduced it years ago, it would soon move to Commuter Rail, Commuter Boat, and Express Bus. There must be something that has slowed down its implementation. I thought RIPTA would accept it when they upgraded there collection boxes on the buses, I know it has the capability, but I think it would need the data connection. It could be a card that serves New England as a whole region and is already in use. The trick with the RIPTA card is that if you’re going to be somewhere for 2 hours or less, just get a free transfer. That said, I’d like to see a super-regional pass that works on RIPTA, MBTA, GATRA, SEPTA, et al. Because I commute into Boston on a regular basis I’d need the regular passes but it would be nice to have one card for all services. Is the card anonymous, like cash? I do not like the opportunities for big brother when the card is smarter than I need it to be. The whole “cash is a hassle” bit is a manipulation by the payment card racketeers wanting to skim their 2 – 4 % off ever more transactions. Guess who benefits most from never updating our pennies, nickels, dimes and quarters? The common sense thing would be to have the dime as the smallest coin, then half, whole, 2 and 5 dollar coins. Once upon a time a handful of change was a useful amount of money to get around with for a day. Why not again? I am questioning the technophilia here. High tech fare collection is expensive! In a lot of places, they do fine with proof-of-payment and little paper tickets. No need for high maintenance, delicate computers in steel armor all over the place. More resources for rolling stock. Instead of programmers and clerks, personnel is out and about checking up and directly helping the riders. Can the ORCA card be paid for anonymously using cash like New York’s MetroCard that can be purchased at vending machines or from newspaper stands? Anyone that uses E-Z Pass on the Newport Bridge, Mass Pike, or the Midtown Tunnel is tracked by big brother. It really becomes a matter of choice whether or not a pass system has tracking capabilities or to what degree tracking is part of a system. This should be part of the discussion if a card is proposed for Providence or Southern New England. A City Card that’s accepted by parking lots and garages as well as for transit is a great idea. Discounts could be incorporated into the card that could encourage transit use. ORCA can be bought with cash at vending machines and other merchant locations. If you do not register it, I think you lose the guarantees to store your balance if the card is lost or stolen. I’m fine with the Big Brother aspects, the systems still accept cash payment for those who want to opt out. Why not just push for the charlie card to be accepted by more agencies? And I mean both inside and outside Massachusetts. It’s disappointing that not all parts of the MBTA accept it yet, never mind neighboring cities like worcester, burlington etc. It would help everyone if all of new england used one card….and it would be even better if all drivers licenses included the chip, so you wouldnt need to carry a 2nd card. It is my understanding that the City of Fall River & Southeastern Regional Transit Authority is also part of the Providence Metro Area. Should this ORCA (One Regional Card for All) be used on the SRTA and also have bus connections with them GATRA & RIPTA as well? I would also like to see Charlie Card used as the ‘regional’ card, even for bus rides here. Why? Implementing a card system is tremendously complex, involving politicians, privacy advocates, huge outlays in hardware, databases, and labor. Even getting Charlie up and running in Boston took years, and it wasn’t cheap. At least with Charlie Card, we could license their service, print out ‘Anchor Cards’ that use the Charlie Card back-end, and just have them pay us back for the fares incurred on our transit. The heavy-lifting is already done. The ‘Anchor Card’ would just be a Charlie with a different logo, for sale on this side of the border. It would be really nice to have a single card that I could take RIPTA, the Commuter Rail, and the T with. Also, shouldn’t parking work on this card, too? That would be awesome, and it would put a transit card into every car driver’s wallet. I know RIPTA has fare integration with the MBTA on their radar, but I don’t think they are actively working on it right now. I agree, a Rhode Island branded Charlie Card would be a good way for RIPTA to go, and bringing all the other agencies in Southeastern New England on board too would be ideal (having a card that works on the Vineyard buses when I go out their, or on the Cape, would be killer). There are some issues, in my opinion, with how the Charlie Card and Charlie Ticket system interact. I’m from Boston, but left before Charlie started, and now as a casual T user, I find the system terribly confusing (partly because it is not fully implemented). I might do another post on my thoughts on the problems with the Charlie system and how any Smart Card system has to not lose the plot on casual users. FYI, I took a bus from Downtown Attleboro to Roger Williams Park & Zoo in Providence. Started on GATRA Bus 24 to Pawtucket near Broadway & Benefit Street, then transferred to RIPTA Bus 77 to Downtown Pawtucket. Then continued as RIPTA Bus 42 into Downtown Providence and trnsferred to RIPTA Bus 20 to Roger Williams Park & Zoo. Not to mention I did take the Commuter Rail between West Medford Ma & North Station, as well as between Attleboro, Providence & Back Bay Station and the MBTA Orange Line between North Station & Back Bay Station, before connecting RIPTA & GATRA. With the exception of my Charlie Card on the MBTA Orange Line and a RIPTA Bus Transfer, no other cards were used and paid cash using dollar coins and quarters. For someone commuting from Attleboro to Rhode Island Hospital without a car, I think it can be done. I did it between Attleboro and Roger Williams Park & Zoo. I know it seems like a matter of install the hardware, come up with a cool acronym, and start handing the cards out, but it’s not that simple. In the San Francisco Bay Area, the equivalent card is Translink, and they’ve been working on its implementation since 2004 at least, with much of the hardware having been in place for a year or two before any given agency actually starts accepting the cards. My guess is that they assumed that the software would be easy and didn’t plan on it taking much time, money, or effort, and were proven very, very wrong. One thing that RI does have going for it is that there is one single statewide transit agency, and even if you take all the connecting ones into account it’s still not that many: RIPTA, MBTA, and GATRA. Compare to the Bay Area where there’s Muni, BART, AC Transit, Caltrain, SamTrans, Golden Gate, VTA, Union City Transit, and another dozen or so small-scale transit agencies that will be joining the Translink system, plus connections to ACE, Santa Cruz Metro, and Monterey-Salinas Transit which won’t be accepting Translink. I wonder if the New York MetroCard is the same kind of card? It was pretty fast to implement in New York, though not all area transit agencies use it. There is no ability to track how much money you have left on your card, except at stations where there are special card readers for checking. Maybe it’s more limited than the ORCA card? Also, there are two kinds of MetroCards, one that can be filled with a specific dollar amount and another that has no limit on the number of rides but is good only for a particular amount of time (day, a few days, week, or month). Metro Card works off a magnetic stripe. Smart Cards have an antenna and a chip in them. One of the benefits is that Smart Cards allow you to touch the fare box, just wave the card over it, Metro Cards have to be slid at the turnstile, and worse, dipped on the bus. The way Metro Cards work on the bus greatly increases dwell time at bus stops as passengers wait for the box to grab and then spit back out their card. The Smart Cards can also hold more information within the card than a mag stripe can. There are actually 5 fare collection points in the current RIPTA box, coins, bills, a card drop, a swipe, and a Smart Card pad. Allowing the schools to use their IDs means that RIPTA is actually processing a number of different card technologies. One thing that I’m surprised hasn’t been mentioned here is the advantage of speeding up bus service with cards like these. Contact-less fare collection significantly hastens boarding, as passengers can simply tap and go. On some forms of transit in Seattle, they allow the Orca Card to be used to board from any door. Increasing the speed of boarding can improve the efficiency of bus service. Also, in San Francisco if you have a pass you can board from any door on streetcars. I like (not) how the state colleges are not represented on the fare box. someone (rep segal?!) needs to create legislation requiring CCRI, RIC and URI to work with RIPTA. Every time URI, a LAND GRANT Agricultural University (or at least it used to offer ag school stuff, probably doesn’t bother anymore) gobbles up more of their open space for parking lots, I die a little inside. The fare boxes on RIPTA buses could be programmed to recognize the Charlie card if RIPTA so wished. They also do RFID. They’re pretty flexible. I think you’ll see a push for more regional systems once the MBTA extends out through the burbs in RI.